Everyone who carries a mobile phone in their pockets can produce video. These days, the video camera is fully integrated into the mobile phone, and at the hand of them, this type of camera has become ubiquitous. Although camera phones have made more popular than ever, the production of home movies, the history of amateur film equipment reaches far back and can be traced back to the early years in the film history. At the beginning of the 1920s a French company developed what was the first portable film camera intended for amateur production. Portability, the most remarkable feature of that camera, has since become the driving force behind the amateur production of moving images. The history of the portable camera begins when the French firm Pathé developed and successfully commercialised the 9.5 mm format in 1922. The system composed of film stock, movie camera, and projector was purposely designed to attend to the amateur market. Other formats were previously developed but none enjoyed the popularity the Pathé had, basically because of its cost and size. The narrow 9.5 mm film stock was reversal-processed which means that it could be directly developed as positive, thus sparing the negative printing process. This feature lowered the costs of production and made possible for the amateur to afford the production of films on a home-based scale. The Pathé-baby format put in the hands of everyone, with no experience, the power to film short sequences on a non-professional scale. The portability of the camera was the most salient characteristic of Pathé’s system. The camera, known as Pathé-baby, was a simplification of the cumbersome 35 mm movie camera. The Pathé-baby kept the basic elements: a lens, a shutter, an internal sprocket to move the film along the film guides, and an external hand crank to operate the camera. The camera was 10 cm height, 10 cm wide, and 0.4 cm breadth; and it weighted slightly more than 0.6 kg. These dimensions and weight made easier for amateurs to carry the camera in a handbag and to shoot a Sunday picnic or a horse race. The Pathé-baby could be easily brought and used everywhere at any moment. 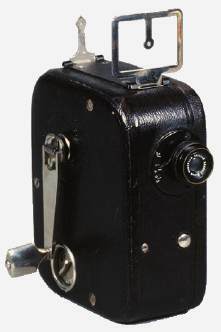 The Pathé-baby made portable, in a reduced scale, the production of moving images. The firsts movie cameras were mobile but not portable. They could be moved to any location where the filming would occur. But the size and length of the industry standard 35 mm film stock made those cameras big, heavy, and expensive. Filming in 35 mm was not, and still isn’t , an easy matter. The Pathé-baby was, in contrast, light enough to be always ready to go and shoot; it didn’t even need a tripod. Its portability allowed it to be an spontaneous media. In that sense, the camera phone is similar. Both cameras are small and both represent different instances of the portable media; which is to say that the tools for media production live in our pockets.